No traders are psychic and no one really knows exactly when the S&P 500 and market in general is going to go up or down even just one day out. But there is a method for predicting the S&P 500’s returns over the next seven to 15 years, and it’s pretty good, according to MarketWatch columnist Brian Livingston. Of course, decade-long forecasts are of no use to daytraders looking to make a quick buck. But long-term investors can benefit from forward-looking estimates and whatever goal you’re saving for, be it college tuition for you kids or retirement 10 years down the road. Are we entering a “go-go decade,” such as 2009–2018, when most stocks grow up, up, up? Or is this the beginning of a “bummer decade,” such as 2000–2009, when stock markets around the world crashed twice, ending not far from where they started? If the next 10 years look like a downer, dude, diversifying your portfolio into securities other than stocks may pay you big dividends. Financial experts like Warren Buffett and Robert Shiller are creators of long-term projection methods with data that goes back more than half a century. It’s well known that Buffett is one of the world’s richest people, and that Shiller won a 2013 Nobel Prize in Economics partly for developing his forecasting formula. Whether or not these seers actually have crystal balls, things have worked out pretty well for them. Stephen Jones, a financial and economic analyst who works in New York City, tracks the formulas that several market wizards have disclosed. He recently updated his numbers through Dec. 31, 2018, and shared them with me. Buffett, Shiller, and the other boldface names had nothing to do with Jones’s calculations. He crunched the financial celebrities’ formulas himself, based on their public statements. • Buffett’s MV/GDP says minus 2.0%. Divide the S&P 500’s market value by the U.S. gross domestic product. Buffett wasn’t the first person to suggest this metric, but he’s said on the record that it’s “probably the best single measure of where valuations stand.” If the index fell 2.0% annualized, your $2,700 would turn into $2,206. Not so great. • Tobin’s “q” ratio indicates minus 0.5%. This metric divides the market value of all U.S. equities (not just the ones in the S&P 500) by the cost to replace all of the companies’ assets. It’s based on academic papers by economists James Tobin, a 1981 Nobel laureate, and William Brainard. This formula predicts that your S&P 500 account will drift slightly lower in real terms, not quite keeping up with inflation. • Jones’s Composite says minus 4.1%. Jones uses Buffett’s formula but adjusts for demographic changes. For example, as America’s population ages, this reduces economic demand. The resulting Demographically and Market-Adjusted (DAMA) Composite has predicted the S&P 500’s 10-year returns more closely than any of the other formulas since 1964. Let’s hope he’s wrong. A 4.1% annualized loss would drive your $2,700 account down to $1,776 after 10 years. That would be a 34% decline, almost as bad as the “lost decade” of 2000 through 2009. The predictions might seem far apart, but they aren’t. The forecasts are all much lower than the S&P 500’s annualized real total return of about 6% from 1964 through 2018. Jones is the first to say that these formulas, including his own, aren’t guarantees and can’t be used to time the market. 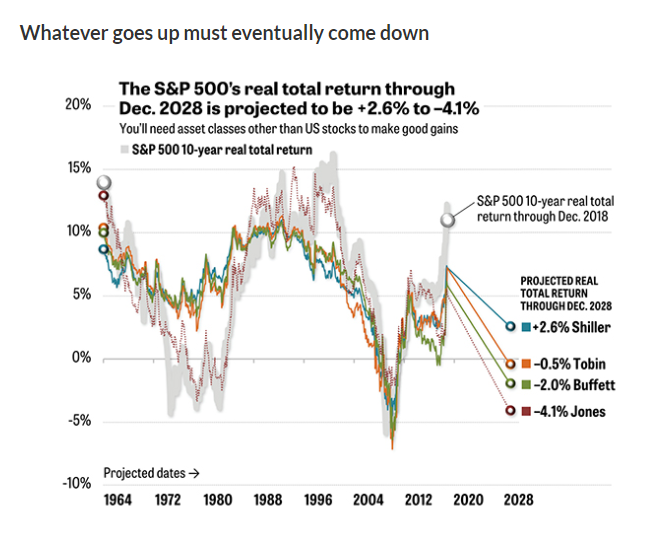 After all, the S&P 500 could go up for the next five years at a 1% real rate, before dropping 9% a year for the next five years. The initial rally, followed by a fear cycle, would suffice to reduce your account to $1,776. That’s not a prediction—nothing about the market happens in a straight line — but remember that the S&P 500 has crashed much harder than a 34% loss TWICE in the past two decades. “The market’s return over the past 10 years,” Jones explains, “has outperformed all major forecasts from 10 years prior by more than any other 10-year period.” He attributes this to the unprecedented stimulation that the Federal Reserve pumped into the economy (and is now removing—watch out below). Markets tend to revert to their average performance over time, which is not nearly as much fun as it sounds. If you can’t use these predictions to time the market, what good are they? For long-term investors, the likelihood that the market is overpriced and will eventually pull back to a lower valuation should flash a bright yellow “caution” light. A disappointing decade is not the time to gamble your money on a 100% stock portfolio. Diversifying into other types of assets can prevent any one index—such as the S&P 500—from dragging down your performance. Long-established strategies such as Lazy Portfolios, which MarketWatch has tracked for years, and the newer Muscular Portfolios, encompass numerous asset classes besides just U.S. stocks and bonds. Those diversifying assets include real-estate investment trusts, commodities, precious metals, and non-US stocks and bonds. During the 2007–2009 bear market, the S&P 500 lost 56%, adjusted for dividends and inflation. In the same period, Vanguard’s long-term Treasury fund VUSTX, +0.00% gained 18%, and iShares’ gold IAUF, -0.11% actually rose 22%. No mater how bad the stock market may get, something else is always going up. You are the captain of your own destiny, but you don’t have to go down with the ship when the S&P 500 hits the inevitable rocks. Diversify now. Jones’s latest calculations aren’t publicly available yet, but you can read all about his methods in a Social Sciences Research Network white paper.